Internet Business AND Your Wealth!" JVManager is in all seriousness the Ultimate Internet marketing tool. An all in one affiliate management solution is a must have for those of us who sell multiple products and want a way to run them all from one set up. You can't beat it. Plus, John spares no effort in upgrading the program constantly. 100's of Warrior members can attest to this. If you ever have any doubt whatsoever about JVManager or John just ask about them in the Warrior forum and see what actual users have to say. My name is one name you rarely see as a testimonial on Internet products. There is a good reason you see my name on this one. "My jaw is on the floor...it's like a dream come true!" "Head and shoulders above the competition." business for you, 24 hours per day, EVERYDAY!" Paul Kleinmeulman (http://www.paulkleinmeulman.com/) - one of the best JVManager's users made over $250,000+ in sales by just centralizing his online business. Watch the video for more information. Imagine you're the CEO of a multi-billion dollar corporation. Would you spend your time doing mind-numbing paperwork, calculating commissions, compiling customer lists, and all of the other 1001 boring :-( little details every major company has to deal with everyday? Odds are, you'd also be working on important things like increasing profits and adding new product lines. You only have a few hours per day to devote to your business. Or would you rather invest your time in MAKING MORE MONEY? I have only been using JV Manager for one month and immediately started saving time and increasing control of my projects by reduced development time. Currently, I am doing all the development myself and even though I could copy/paste much of the payment processing code, there was still so much work to do. The added security that JV Manager provides for downloading products has also saved me time and difficulty in that I no longer have to encrypt my payment pages. No more worry about people finding my download page and gaining access to my products without paying. I just downloaded the newest version and can't wait to implement the new features. These were just too difficult for me to develop myself, so I didn't. Now I can with JV Manager! I'll bet you got into Internet Marketing because you want more TIME for yourself and your family, not just more money. More money = more work = less free time. And it's no accident that you're here. Just like every other successful Internet marketer, you need an all encompassing system that removes the pains-taking work and drudgery from your Internet business. More time AWAY from running your business, which equals more time to do whatever you want to do. And MORE money, with equals more choices, more independence, and more freedom for you. It's only NATURAL that you want these things. And I have found the ONE economical way to provide it. It's called JVManager, and it isn't just for joint ventures. Business into Accelerating Profits, by Simplifying and Streamlining Administrative Tasks, and Optimizing Your Assets. I've been using JV Manager since it first came out and it's been Godsend. I ordered it when I left my first Internet marketing seminar and everyone stressed automation. After finding your software, I haven't had the need to look for anything else it has been more than enough and still improving all the time with your updates. I can say I'm proud to own and use JV Manager daily to expedite my online marketing campaigns. Big thanks! Would you believe many Internet businesses have NO engine? We're not talking about a sputtering two stroke, or sluggish four cylinder, either. We're talking 8 cylinder, speed-demon HEMI Magnum performance! So POWERFUL, no matter how big your business gets, you'll NEVER outgrow the engine. It doesn't matter if you have a little business striving to become big, or a GARGANTUAN business growing even BIGGER. THIS WILL DO THE JOB FOR YOU. It's CRUCIAL for the Life, Growth and L-o-n-g-e-v-i-t-y of your business that you own this software. You Will Save Yourself Time -- No more being endlessly bogged down with trivial tasks. You'll Eliminate Frustration -- Everything is in one place, at your fingertips. You'll Reduce Your Stress -- JVManager is the best stress reducer an Internet marketer can have. You will sleep better, and work better because you're no longer sweating the small stuff. It's taken care of AUTOMATICALLY. You'll Easily Streamline Your Operations to make them smooooooooth flowing and practically effortless. You'll Enhance Your Professional Image by appearing to your customer to be a big shot with a full time staff, even if you're just a little shot trying to be big. You'll Enjoy Maximum Flexibility, have it your way, run you business the way YOU want. You'll Possess More Marketing Options, just like the big boys. You'll Discover Additional Income Streams with your current products and services. You'll Have Happier Customers, because their needs are met IMMEDIATELY. "JV Manager Is The Winner Hands Down"
You've done it again John! Never before have I seen such a powerful program combining "all the best" features into one. After looking at so many other pieces of JV / Affiliate software, yours is the winner, hands down. You've made it possible for anyone to kick their JV campaigns into "turbo" drive and increase their profits ten fold." "You Really Have Over Delivered!" John, you have really covered everything! Now I can offer my customers a choice of payment methods, yet still offer automated tracking of sales for all my affiliates. On top of that, I can automatically protect my download areas with JVManager's generated password protection. Best of all, even I can set it up! You really have over delivered. It doesn't matter if you're developing your very first product, simply selling resale rights products, or you're doing $1million in business per month . . .
JVManager is for You, it's that flexible. Do you know the COST of being disorganized, having to compile lists by hand, answer emails by hand, etc? Figure your time is worth at least $50 per hour; that's $12,500 you're unintentionally wasting per YEAR! Don't think your time is worth $50 per hour? If you sell a $27 product, for example, and you spent that one hour per day doing something to promote the product (rather than doing dumb administrative stuff) and you sold just two copies of that product, your hour was worth $54. But what if you sold 5, or 10, or 100 products with your promotional effort? Or what if your product sells for $97, or $297? Or what if you spent that hour working on a new product you're creating. Let's say you invest 75 hours creating this product, it sells for $47, and you sell 100 of them. Your time was worth $62.67 per hour, not even counting the back end sales you'll make. If you sell 1000 copies, your time was worth $626.67 PER HOUR. So when I say your time is worth at least $50 per hour, I'm not exaggerating, I'm understating! Even if JVManager saves you just 20 minutes per day, everyday, that's Seven-thousand, three-hundred EXTRA minutes per year! Extra 121 Hours of FREE Time This Year? JVManager is the Net's Most Flexible and Complete Sales, Customer, Affiliate and JV Management System for the Net's Most Demanding Community: Sellers. Automatically accept payments through various payment gateways. Set up and run both free and paid membership sites (including automatic pass code generation and protection.) Just imagine if you had several hundred (or thousand) members paying you each and every month for access to your website! Digitally deliver your products within seconds of payment being received. Protect your products from theft. If you're not currently protecting your products, I GUARANTEE they are being stolen and you are losing money. Offer, manage and run unlimited affiliate programs EXACTLY the way YOU want to. Automatically handle your Joint Venture tasks. Keep you organized (and sane) for the rest of your online life. "I installed JVManager in just minutes...it was so easy!" It was so easy! This is a fantastic piece of software. I understand now the hard work you must have put into it and why it took so long to put together, no wonder. JVManager has got to be an essential piece of software for anyone making a living on the Internet. 365 days per year, and yet charges NO MONTHLY FEES! Compare that to online services that offer far fewer features, yet they charge you a minimum of $79 PER MONTH! That's almost ONE THOUSAND dollars per year, EVERY year. And as your list grows larger, they will charge you even more per month. Remember when you imagined being the CEO of a multi-billion dollar corporation? You were able to lead your company into ever greater profits because you had employees who took care of all the little day-to-day details for you. First, let's meet . . . When You Use the Package and Product Manager, Centralizing & Organizing Your Business Becomes a Breeze! Thanks to the inception of resale rights, many Internet marketers have more products than they can keep track of in the first place. Then when they're just getting started, they can make the rookie mistake of hosting their products in numerous locations. Talk about mass confusion! Starting today, you'll keep track of all of your products in one central location, while simultaneously boosting your profits. You can even create packages of products, even if they cannot be bundled together by "grouping the order links." For example, let's say you want to sell a package of 5 ebooks that must be sold as stand alone products. You can create a Package through JVManager, add all 5 Products and use a 6th one to give as a Bonus to everyone who purchases them ALL! Simple! Product Grouping into Packages is a surefire way to make sales. But did you know that JVManager was the FIRST to offer this capability? JVManager stays on the cutting edge, with never-ending innovations and mind-bending improvements. More payment gateways will be added in the future. Choose a service such as Paypal, and receive your money INSTANTLY! No more waiting for months to get what is rightfully yours NOW. With JVManager you can distribute your products instantly NO MATTER what payment system is selected by the customer. Your customers will reach your instructions to download their purchase or to access their memberships right after completion of their order. ...And Protect Your Online Property! Theft of online products is at an all time high. You can protect your intellectual property by HIDING the actual URL of the links for your "Thank You" pages. And you can also EXPIRE those links in any number of days you choose. You can AT LAST keep records for all of your sales in ONE central location. Search and display all sales using the criteria YOU choose, such as time periods, product title(s), affiliates, etc. automatically collect payments on their "subscription." Talk about hands-off automation: your customers will have ONLY 1 SET OF CODES. This means that a customer's email address and password reaches ALL of their purchases through a centralized customers' area. And even if a paying customer has NEVER obtained a "password" for accessing that central area, JVManager will issue a password upon request! Have you ever had a customer ask for a refund AFTER you paid the corresponding affiliate for the sale? For example, if you're selling a $100 product with a 50% commission, you took in $100, paid $50 to the affiliate, and now you've got to refund $100 to the customer. That $100 sale has now cost you $150, LOSING YOU $50 in the bargain. The commission is not credited to the affiliate - if any exists for that sale. This purchase is marked as refunded for your records. The affiliate is paid after the guarantee period expires. Thus, you CANNOT lose money! Of course, if you define 0 as the "Guarantee" period, you turn this feature off and instant commissions are applied to your affiliates' accounts. The Best Affiliate Solution That Exists Today On The Net. Period. You can include in your affiliate program ALL of your Packages or SOME of them: You decide! You can even assign a package to be offered to a specific AFFILIATE GROUP - read below. You can offer a separate HOMEPAGE for each of your Packages, which can reside on DIFFERENT servers. You can include any Products in your affiliate program, no matter WHERE they're located. The affiliate manager works with all payment gateways and separately from them. For example, if you use ClickBank.com, your affiliates are paid by you and not by ClickBank.com. The affiliate manager also works with subscriptions. You can choose to use, for example, Paypal.com's IPN system for automating a subscription, or use JVManager's INTERNAL subscription system for selling recurring services THROUGH ANY payment system or retailer, EVEN CLICKBANK.COM! You can offer commissions by percentage (%) or flat amounts OR BOTH (read below). You can offer a 1-tier or a 2-tier plan OR combine plans. For example, you can create 1 Package with 1 Product that offers 50% commission on 1-tier only, a 2nd product that offers a commission of 50% on 1-tier and $5 on 2nd tier, etc. You can also offer commissions per click. For example, your affiliates can get $0.10 for each click their affiliate links send to the homepage of Package A. Your affiliates can link to either the homepage of a Package OR to the ORDER LINK of the Package or ANY page you want them to promote. You can use some specific affiliate tags (homepage, order link, ANY link) and offer PERSONALIZED promotional materials to your affiliates in a snap! You can create the HTML page you want for each Package, include those special tags, and JVManager will replace them with the affiliate's information and links. This also means your affiliates can include their own DIRECT ORDER LINK inside their ebooks, html pages, etc. You can pay your affiliates through Paypal e-a-s-i-l-y. JVManager will create 1 pay-now-button for each payment. You just pay each affiliate and return to your site right after payment. OR you can mark commissions as paid, in case you pay them by check. Or you can use mass payments! You Can Get MORE AFFILIATES by rewarding your affiliates for referring sub-affiliates. For each sub-affiliate referred, your affiliates receive the dollar amount you choose. That commission will be added to their account automatically ONCE sub-affiliates COMPLETE the double opt-in registration procedure AND are ACTIVATED by the administrator - you. Only affiliates that have completed the double opt-in registration procedure AND have been ACTIVATED by you can participate in your affiliate program. Or you can put it on auto-pilot and make JVManager automatically accept affiliates. You can also DE-activate an affiliate. If you are informed that someone abused your terms and conditions, you just click once and he/she is banned. You can define Affiliate GROUPS for offering specific Packages only to specific affiliates. Example: Say you offer Packages A, B, and C, You can create 2 affiliate groups (or as many as you like.) One Group for "ALL" of your affiliates and another one for your "JV partners" because you want to offer higher commissions to your JV partners. You can include Packages A and B to the Affiliate Group "ALL," and Package C to the Affiliate Group "JV partners." You can then define the groups an affiliate belongs to when you activate his/her account. You can even define individual "Special Commission Plans" for specific affiliates/ JV partners. For example, instead of normal commissions, you can define that your affiliate John Doe will get 70% on 1-tier and another 10% for 2-tier sales for the Package A, OR for a specific Product INSIDE a Package. Your affiliates can build their lists, too! They can add THEIR sub-affiliates to an autoresponder of their choice. They can ALSO add the CUSTOMERS they send to YOU to an autoresponder of their choice! Just in case your affiliates do not have an autoresponder to use, they can also define a DEFAULT message to be sent once their sub-affiliates are registered and activated by the administrator - you. Are you beginning to see the many possibilities for simultaneously automating and growing your business? Suppose you partner with John Doe and you want to report the sales of a specific product to him. When adding that product into a Package, you can insert John Doe's name and email address. Each time an order is placed for that specific Product, John Doe will get a notification email. Or suppose you want to promote a friend's Product, and her name is Helen. Helen sells her ebook through Paypal.com. She gives you her Paypal address and the downloading instructions for your customers. You include this information in JVManager by creating a Product for Helen's ebook, you type her name and email address, and here is what happens: Your customers pay Helen (instantly) and return to your site. Helen gets an email message, too, that informs her about the sale - she also gets informed by Paypal.com anyway. The same scenario above can be used both with ClickBank.com and 2Checkout.com. Here is how: Helen will give you her ClickBank ID and the Number of her "Thank You page." You'll give her a special link to include to her ClickBank account to that "Thank You" page's slot. That's it. Your customers will pay Helen through ClickBank.com and return to YOUR site. Can you IMAGINE the ways you can use this UNIQUE Turbo-Feature? Suppose you want to give Helen's Product as a Bonus with a DISCOUNTED price IF your customers BUY some other products of yours. You can create a "LOCKED" Package and your customers will pay for each Product in the row - including Helen's product. Or perhaps Helen wants to almost GIVE AWAY her ebook for $0.10 to YOUR customers, but ONLY to those who will buy your Product. Your customers will pay for your Product, then the minimal fee of $0.10 for Helen's ebook. Why would Helen do that? For increasing her customer list, of course! The same procedure is followed with 2checkout.com: Helen gives you her 2Checkout.com ID and the ID of the product she has created. You give her a special URL to include in that product at 2checkout.com. Customers pay Helen and return to your website. Suppose Helen does not have any special Product you can promote for her. But you feel obliged to Helen because she has helped you. Here is what you can do: You can tell Helen to register as your affiliate. Helen does it, you approve her account, and she gives you her ID. You can include Helen's affiliate ID in ANY Product you sell and define a CHARITY COMMISSION - this will be the commission Helen will receive on each sale FOR THAT SPECIFIC PRODUCT. This could be a 1-tier or 2-tier commission, based on % or a flat amount. Each time that specific Product is sold either by you or by your affiliates, Helen will get the commission you have defined. If an affiliate exists for that sale, he/she will get his/her normal commission, and Helen will also get her "charity commission." You can then pay Helen through Paypal.com whenever you want. The same feature can be used for DONATING a % of a sale for a specific Product to a Charity - or to ANY other person that can register with your affiliate program and has an account with Paypal.com. A message to your customers when they first buy something from you. A message to your affiliates when they register. A message to customers of a specific Package when they first buy any Product of that Package. Your customers of a specific Package to an autoresponder you have defined! To your JV partners when a product is sold. To your affiliates when a refund is executed. Mass Email Customers & Affiliates, But Only Those You Want To! You can email customers of a Specific Package. You can email customers who have spent LESS than $100.00 or MORE than $100.00 or more than $1,000.00 on your sites. You can send individual messages to customers who purchased, for example, Product A AND Product B BUT NOT Product C! You can email AFFILIATES who have generated commissions of less than $100.00 or more than $100.00 or more than $1,000.00 for your Products on all of your sites. You can even add the products you want to a separate Shopping Cart. Use the Shopping Cart as an EXTRA selling system! An AWESOME way to create your JV collections. Everything is automated! And the same shell can be used for JV Brokering: Commissions are paid to you, your JV Broker and affiliates. "The Best I've Ever Had..."
John, all I have to say is, your *Grade A* 'Fillet Mignon' of Management Centralization is the best I've ever had ... JVManager needs no A1 sauce... especially after you seasoned it with an extra special 'BAM!' of an upgrade... No need to bring in dessert as JVManager provides more than enough to fill any Netrepreneur's plate! What Else Can JVManager Do For YOU? JVManager is Customizable, to Look Like YOUR Site. It's a Shell. You Control EVERYTHING! Your thank you pages, and so on. All with EASY Installation! ONE CLICK! And the Best Top Notch Support Available! You receive a complete online MANUAL that is constantly updated. You receive more than 15 online tutorial videos that show you step by step how to do anything we've covered here and much, much more. You receive technical support from our professional staff through the online HelpDesk. You can even participate in the exclusive, Member's Only JVManager Forum. Do you know the One Outstanding Secret that distinguishes the successful online marketers from the others, yet you almost never hear about it? Many marketers don't know it. Some have intuitively guessed the secret, but don't know how to take advantage of it. And others, the really successful ones, exploit this secret to the max every single day. You are smarter than most, or you wouldn't have read this far. Would you set up your operation so that you WOULDN'T KNOW who your best diamond dealers were? Would you store your diamonds in different locations all over the country? Would you make it so complicated to follow up with customers, you wouldn't even bother? Would you forget to collect vital information about your sales, affiliates, customers and dealers? Yet, this is EXACTLY what happens to most Internet marketers. They're selling a product over here, and another one is selling over there, and in the process they lose all track of who their affiliates are, how much they're selling, and which customers purchased what. In Internet marketing, the REAL money is made ON THE BACK END. But if you don't have the systems in place to properly track everything that's happening, and then appropriately follow-up, YOU WILL LOSE MONEY. All of your records are in one place. All of your affiliates' information, all of your databases, pass codes, EVERYTHING in one location. When you use JVManager, you will create a network of success around you and your product/s that will increase your profits. Most people today open an account with Clickbank or Paypal and start selling, because, unlike you, they just don't know any better. However, while they can take orders using these services, they cannot collect VITAL information about their sales, affiliates, customers, and joint venture partners. In order to succeed on the Internet, you must constantly use a CENTRAL POINT through which you'll be able to CONTROL and MONITOR EVERYTHING you do - especially your sales. Think of it as sitting in the Captain's Chair of your own Starship. You're able to navigate the galaxies at =warp speed = because your have everything you need at your fingertips. than you ever thought was possible! I believe that JVManager is the BEST product available. And as you can tell by the testimonials in this letter, my customers agree; JVManager is the single BEST SOLUTION for automating your business like the true professional you are. Other services charge by the month. At $79 per month, you're looking at almost $1,000 per year, every year. When you purchase JVManager, you're not "renting" it, you OWN it. And I don't ask for $1,000 per year, or even $1,000 one time. JVManager is just $97, and it's worth every penny - and considering that you'll get 6 months of full elite level member access to MM1 (What's MM1? - Read more here) as a bonus, I would say that it's a STEAL! "JV Manager can be described in one word: Remarkable!" Ever since I installed JV Manager there has been more organization to my business. Everything is right there at a click of a button for me to see. From sales to commissions to products bought and much more. No longer do I have to login from program to program trying to find who bought what and when or what commissions I need to pay. It's all there in one "easy to locate" interface. Plus, unlike most programs where the creators guarantee you lifetime upgrades and you never see an upgrade in your lifetime, John is constantly working on JV Manager and making it better. I can't wait to see what else you have in store for JV Manager. JV Manager is hands down the most complete ecommerce system you can buy. Kudos to you, John, on a product that far surpasses the hallmark of excellence. The multiple aspects that you have overloaded this one special script with are everything someone like myself who's passionate about JV's could ever want -- it's like a dream come true! These Exclusive Videos Will Show You Step-by-Step How to Maximize The Results You Get Using JVManager 1 to Run Your Business. Through these videos you will learn how you can get any product - it can be your product, or any product you get with resale or Private Label Rights (PLR) and sell it through JVManager 1, OR any other system. 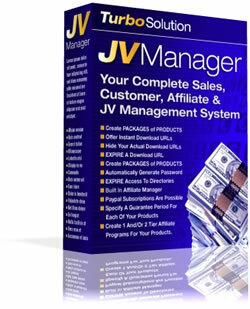 You will also see how to install JVManager 1 in simple steps and how to create your first affiliate program and thus be ready to start selling your products. While the 7 Fast Start videos use JVManager 1 as the sales and affiliate manager system, you can follow the same instructions for editing the sales page, uploading the ebook and selling it through any system you want. Even though JVManager offers a LOT of features, you can install and set it up quickly for selling your products - we'll show you how. For our example on this video, we took a product released by TurboMembership.com that offers a brandable PDF file. You can follow these same instructions for any PLR product that you sell. We will show you how to upload the ebook through step-by-step instructions. In this video you will learn how to password protect a directory through your cPanel and thus protect your digital property. JVManager 1 has a special feature through which it delivers the product without asking the customer to insert the username/password of that protected folder. If you do not use JVManager you can just protect the download area and then include those codes inside your thank you page. In this video you will see how to quickly create a Package in JVManager, your first affiliate group and how to setup everything through simple-to-use step-by-step details. In this video you will see how to add your Product into the Package feature of JVManager 1, define the protected download area in the record, place the username and password in it and be ready to start selling the product. ALL videos are ideal for people who want to easily setup and sell any PLR product. As said, having JVManager 1 is a big advantage in all of your marketing efforts, but you can also follow all the step-by-step details for applying everything with any other sales and affiliate system. Take JVManager for a spin... Put the program through its paces. Lift up the hood. Kick the tires. Order today and if you judge JVManager is not what I described, then you'll promptly get your money back - no questions asked. Just submit a refund request and get your refund - it's that simple, because I am THAT certain JVManager will BLOW your brain once you see what it can do for you. membership access to MM1 after payment. Do you want to SELL JVManager 1 and keep all money in your pocket? P.P.S. Imagine 2 people pull up in your driveway. They're both driving 1967 Chevy Chevelles (AWESOME-COOL CARS!!!) and on the outside they look almost identical. You find that the first one has a 120 hp straight-six engine with a 3-speed transmission on the column. It will do 0 to 80 mph (its top speed) in about 30 seconds. The second one has a 500 hp SUPER-charged 396 with a 5-speed, and will go from 0 to 160 mph in under 30 seconds. Which one do you want to drive? The one your Grandma would enjoy puttering to the store in, to get milk? Or the one that will get you ANYWHERE you want to go a whole lot faster, and is a whole lot MoRe FuN to drive? Order JVManager TODAY, You'll be Happy You Did! EVERY EFFORT HAS BEEN MADE TO ACCURATELY REPRESENT THIS PRODUCT AND ITS POTENTIAL. THERE IS NO GUARANTEE THAT YOU WILL EARN ANY MONEY USING THE TECHNIQUES AND IDEAS PROVIDED BY THIS WEBSITE. EXAMPLES IN THIS PAGE ARE NOT TO BE INTERPRETED AS A PROMISE OR GUARANTEE OF EARNINGS. EARNING POTENTIAL IS ENTIRELY DEPENDENT ON YOU. WE DO NOT PURPORT THIS AS A GET RICH SCHEME. ANY CLAIMS MADE OF ACTUAL EARNINGS OR EXAMPLES OF ACTUAL RESULTS CAN BE VERIFIED UPON REQUEST. YOUR LEVEL OF SUCCESS IN ATTAINING THE RESULTS CLAIMED IN OUR SITES DEPENDS ON THE TIME YOU DEVOTE TO THE IDEAS AND TECHNIQUES MENTIONED, YOUR FINANCES, KNOWLEDGE AND VARIOUS SKILLS. SINCE THESE FACTORS DIFFER ACCORDING TO INDIVIDUALS, WE CANNOT GUARANTEE YOUR SUCCESS OR INCOME LEVEL. NOR ARE WE RESPONSIBLE FOR ANY OF YOUR ACTIONS. MATERIALS IN THIS WEBSITE MAY CONTAIN INFORMATION THAT INCLUDES FORWARD-LOOKING STATEMENTS THAT GIVE OUR EXPECTATIONS OR FORECASTS OF FUTURE EVENTS. YOU CAN IDENTIFY THESE STATEMENTS BY THE FACT THAT THEY DO NOT RELATE STRICTLY TO HISTORICAL OR CURRENT FACTS. THEY USE WORDS SUCH AS ANTICIPATE, ESTIMATE, EXPECT, PROJECT, INTEND, PLAN, BELIEVE, AND OTHER WORDS AND TERMS OF SIMILAR MEANING IN CONNECTION WITH A DESCRIPTION OF POTENTIAL EARNINGS OR FINANCIAL PERFORMANCE. ANY AND ALL FORWARD LOOKING STATEMENTS HERE OR ON ANY OF OUR SALES MATERIAL ARE INTENDED TO EXPRESS OUR OPINION OF EARNINGS POTENTIAL. MANY FACTORS WILL BE IMPORTANT IN DETERMINING YOUR ACTUAL RESULTS AND NO GUARANTEES ARE MADE THAT YOU WILL ACHIEVE RESULTS SIMILAR TO OURS OR ANYBODY ELSE'S, IN FACT NO GUARANTEES ARE MADE THAT YOU WILL ACHIEVE ANY RESULTS FROM OUR IDEAS AND TECHNIQUES IN OUR MATERIAL. Software Disclaimer: The software is distributed "as is" and with no warranties of any kind, whether express or implied, including and without limitation, any warranty of merchantability or fitness for a particular purpose. The user (you) must assume the entire risk of using the software. In no event shall any individual, company or organization involved in any way in the development, sale or distribution of this software be liable for any damages whatsoever relating to the use, misuse, or inability to use this software (including, without limitation, damages for loss of profits, business interruption, loss of information, or any other loss)." JVManager™ and Fantasos™ are TRADEMARKS of The Internet Company LLC. All names of products and/or services mentioned are registered trademarks or trademarks of their respective companies.